New IDES data show that Illinois’ overall jobs growth was weak for October. While the greater Chicago area had tepid jobs growth over the year, the rest of the state lost jobs. Though Illinois showed a net gain of 2,200 payroll jobs in October, the state’s workforce shrank for the sixth month in a row, according to a Nov. 17 economic release from the Illinois Department of Employment Security, or IDES. The state unemployment rate rose to 5.6 percent from 5.5 percent because the number of unemployed Illinoisans increased by 6,100. The bright spot in Illinois’ October payroll jobs report was a gain of 4,800 jobs in professional and business services. Manufacturing also showed a gain of 1,600 jobs, although the September number for manufacturing was revised downward by 1,000. 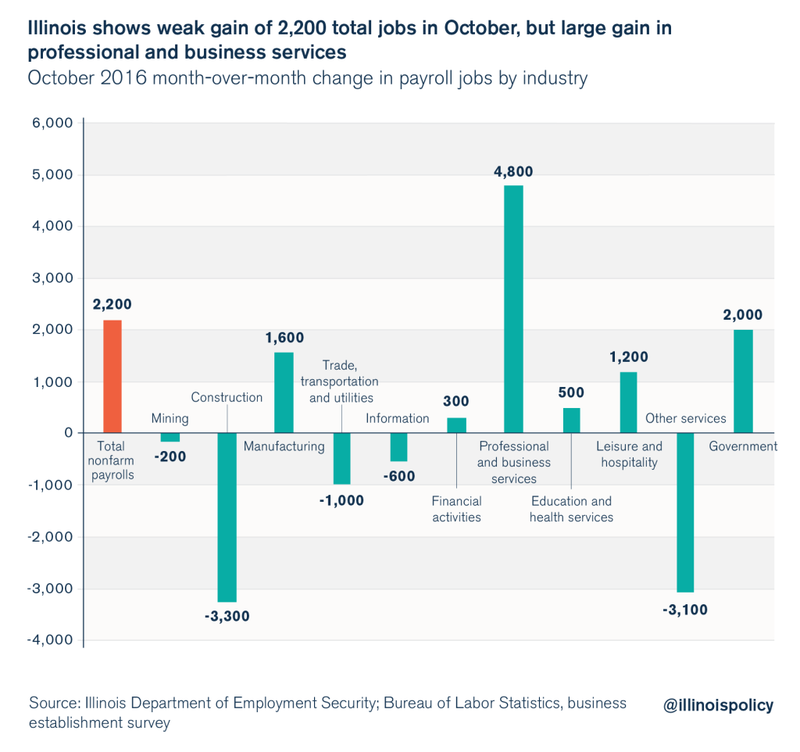 Illinois had large job losses in construction (-3,300) and other services (-3,100) in October. Bureau of Labor Statistics, or BLS, officials also made substantial revisions to the September jobs report. The overall number of jobs gained in September was raised to 11,500 from 7,400 jobs. Under the surface, there were significant revisions upward to September’s government job gains (revised upward by 4,700) and education and health jobs (revised upward by 3,100). BLS, though, made significant revisions downward for leisure and hospitality job losses (revised downward by 1,500) and manufacturing job losses (revised downward by 1,000). 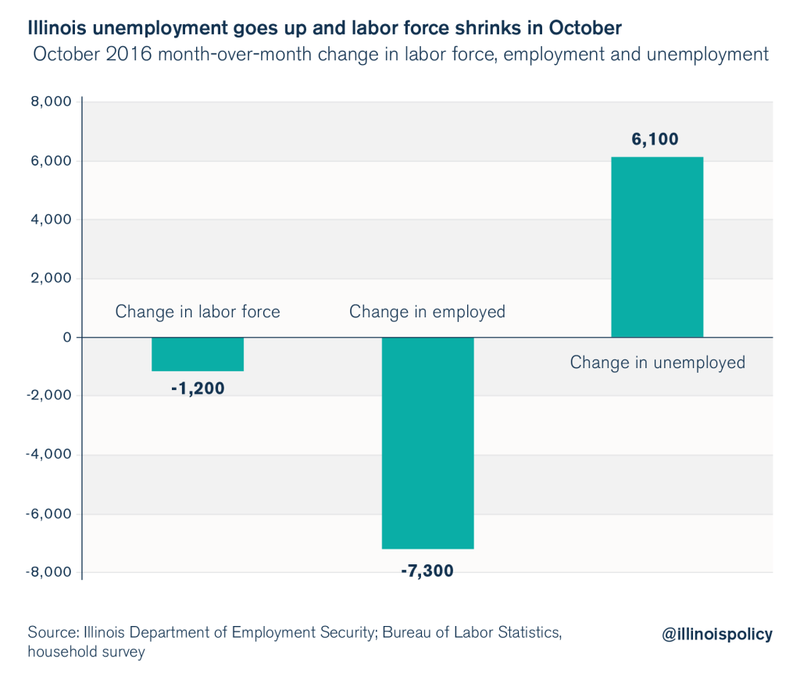 The household portion of the survey on which the IDES numbers are based showed that Illinois had more workforce dropout in October, and the number of unemployed rose. Because 7,300 fewer Illinoisans were employed on the month, the workforce shrank by 1,200, and the number of unemployed increased by 6,100. As a result of the month’s higher unemployment, Illinois’ unemployment rate rose to 5.6 percent from 5.5 percent. 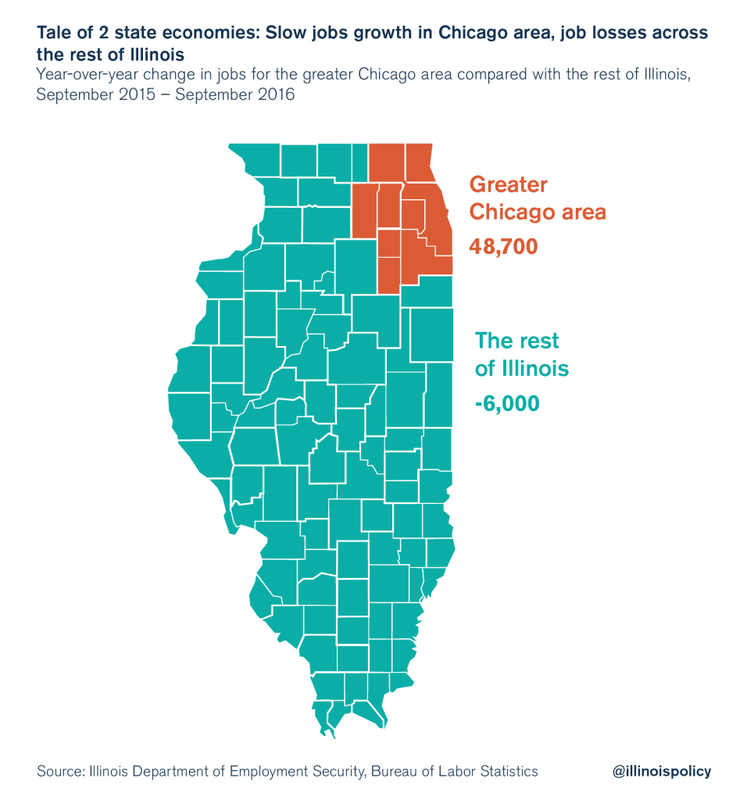 Trends in different regions of Illinois shed light on the overall state job numbers. The new IDES data show weak overall state jobs growth in October, but the previous year of local data (September 2015 – September 2016) show an uneven distribution of job gains and losses. While the greater Chicago area had tepid jobs growth over the year, the rest of the state lost jobs. Downstate communities that rely on manufacturing and industrial occupations suffer under a tax and regulatory environment that is especially costly for employers in these kinds of fields. Illinois’ uncompetitive business climate affects hiring in industries such as manufacturing much more than it does in other sectors. This drives down well-paying job opportunities in the downstate communities that depend on them. On the other hand, the greater Chicago area service sector industries continue to do some hiring, if at a relatively slow rate compared with other parts of the country. Illinois’ tax and regulatory policies hurt Illinoisans throughout the state – but they are especially unfair to downstate communities. Illinois needs tax and regulatory reform to unleash economic growth and allow all areas of the state to thrive.